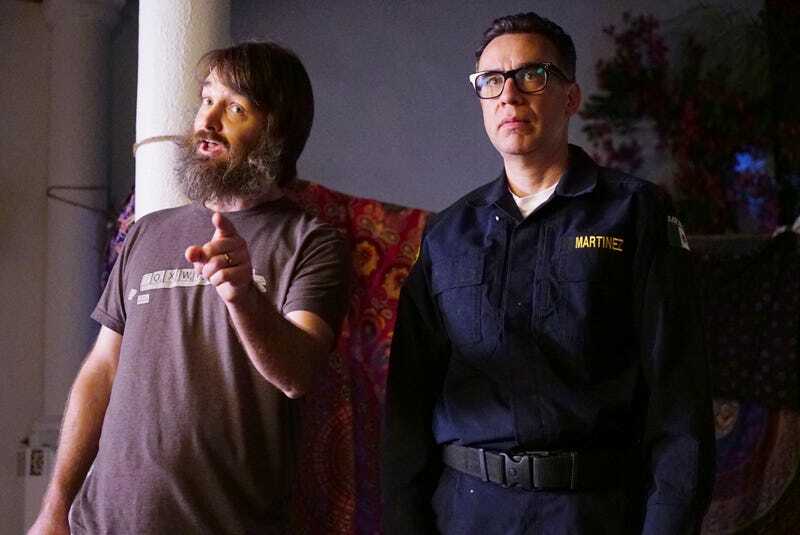 After being off the air for a month, The Last Man On Earth returned last week with a POV episode about Karl Cowperthwaite, a dorky cannibalistic serial killer played by Fred Armisen. The episode illustrates how Karl’s social awkwardness and mundane lifestyle disarms his victims who naturally don’t believe he’s capable of cannibalism. It also treats Karl’s flesh-eating compulsion as an addiction, something he believes that he can recover from through immersion. It’s why he murders his friend and last remaining prison guard Martinez when he tries to abandon him. It’s why he takes Martinez’s identity as soon as Tandy and Todd pull up to a Juarez prison looking for Jasper. He wants another chance at a regular life. “Paint Misbehavin’” introduces Karl to the rest of the gang, which goes as predictably as anyone would expect. He tries to stay on the straight and arrow, but soon enough, he’s digging Gail’s bloody Band-Aid out of the trash and using it as a tea bag. As soon as he’s acquired the taste of flesh once again, he takes up Gail’s request to paint her for Erica’s birthday and plans to kill her like all of his other victims. It’s only his guilt and self-loathing that sends him away from his new friends and towards a graveyard where he can feast on the dead. This isn’t a bad idea for a story per se, but “Paint Misbehavin’” hits the same morbid note over and over and over again, so much so that the core idea—a murderer struggling to stay “sober”—never really takes flight. Armisen plays Karl well enough, but the character as written still has such little room for development that all Armisen can do is repeatedly run through well-trodden territory. He’s nice, then creepy, then overcome with guilt and shame. Rinse and repeat until the end of the episode. It’s neither funny nor compelling enough to justify the repetition. Adding insult to injury, the episode poses another interesting idea that it almost immediately deflates. Tandy quickly becomes suspicious of Karl’s behavior, especially after he tries to convince Tandy that he was a semi-professional pianist with a terrible rendition of Elton John’s “Benny and the Jets.” Unfortunately, the rest of the gang doesn’t believe him because Tandy is a terrible judge of character. His first impressions of the entire ensemble were almost unanimously incorrect, so why should they take him seriously now? Tandy’s impulsive, foolish behavior makes it easy to dismiss him, but it also allows for the gang to accidentally gaslight him simply because he’s “the man who cried murderer.” But instead of going down that path, Tandy quickly convinces Todd that Karl ain’t right in the head, and sure enough, they watch him take a bite out of a dead body at a graveyard. There’s just not a lot here to unpack, and frankly, that’s become the modus operandi of LMOE this past season. After so many location changes, new threats, and gruesome deaths, the series has hit a rough patch, clearly struggling to heighten the stakes and generate tension any way it can. Part of the problem is that the series is defined by constant changes (even if those changes just mask the series’ status quo), and there are only so many shifts one can make before creative obstacles emerge. Karl doesn’t really work as a character, but he won’t be around for long, just like Pamela, Pat, Lewis, and Phil before him, and sooner or later, the series will introduce another new character or move the gang to another location. It’s entirely possible that LMOE has some new tricks up its sleeve, but they have yet to reveal themselves. As of now, the old tricks have finally become stale, no matter how many cannibals you throw into the mix. Apparently, this was the series’ winter finale, despite being back for only two weeks? Blame sports! See ya in March! The gang is still looking for Jasper, despite Melissa’s pleas to leave him alone because she knows that he left because they were smothering him. It’s later revealed that Melissa secretly leaves him a cooler, presumably full of food. Jasper, sporting a Hobbes onesie, picks it up silently and goes on his way. Karl’s made-up nicknames: Code Forgetter, Point Emphasizer, Everyone Forgiver, and Nickname Accumulator. It’s an easy joke, but Gail saying that she couldn’t be friends with a “Pyscho Killer Qu’est-ce que c’est” made me laugh. Chekov’s Rubik’s Cube Report: Still hasn’t exploded.